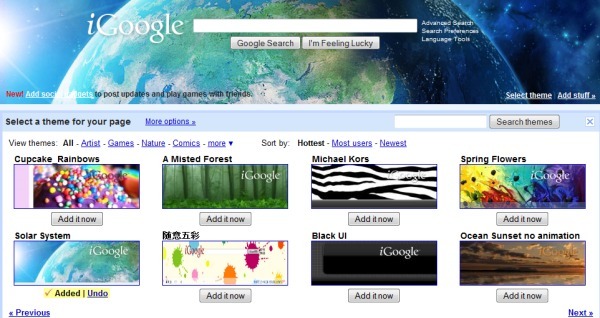 iGoogle didn't make it easy to change your themes: you had to visit a separate page, find a theme, add it and then repeat the process until you found a great theme. Now it's easier to pick a theme: click on "Change theme from [insert current theme's name]" and you'll see a small list of themes. You can select a category, sort the themes by popularity or recency and even type a query like [puppy], [flowers] or [batman] in the search box.